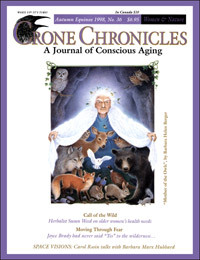 Crone Chronicles #36(original) Women & Nature [cc36] - $6.95 : BBI Media - Magazines that feed your soul. This autumn equinox issue of Ann Kreilkamp’s Crone Chronicles is dedicated to celebrating the connection between older women and the earth itself. Beginning with Ann's editorial discussing the metaphor of Nature as Machine (she's against it! ), in this issue Crone authors, artists, poets and readers tangle with the real experience of nature: gritty, frightening/transformative and sacred. We begin with "Moving Through Fear" by Joycle Brady, in which she describes how her growing understanding of genuine wildness enabled her to find courage for all parts of her life; next "My Home, My Womb" by White Song Eagle explores her altar-rich, naturally embodied home. In the Crone Health section, three related articles describe the detailed and controversial issue of the use of natural progesterone. The heart of the issue is undoubtedly the detailed, sassy, Pagan, and no-nonsense interview with legendary feminist herbalist Susun Weed, author of the best-selling New Menopausal Years the Wise Woman Way (for Women 30-90) and Breast Cancer? Breast Health! Another exciting interview explores the world of organic artist Mary Wright. A large part of the issue is devoted to a series of evocative short anecdotes from women sharing their experiences in nature, ranging from Nan Sea Livingstone's shocking "Through the Binoculars" to Amy-Marie's lyrical "When the Earth and the Rain Made Love" to Nadene's richly detailed description of her garden "This Place is Me." Last in the issue is the first of Ann's in-depth interviews with selected "evolutionary agents" — this being part one of a two-part series of interviews with planetary visionary and futurist Barbara Marx Mubbard. There's so much packed into this 84-page issue that you'll spend hours absorbing its tasty, full-bodied wisdom. 84 illustrated pages, edited by Ann Kreilkamp, released in Autumn Equinox 1998.
Who Are the Modern Gods?